With Easter approaching and the weather looking is looking like it is going to be nice and sunny. Many of us will take advantage and carry out some good old DIY in the garden. One of the projects that you may be considering is removing the garage or shed roof. Before you even start have you established wether it is made of Asbestos Cement Sheets? 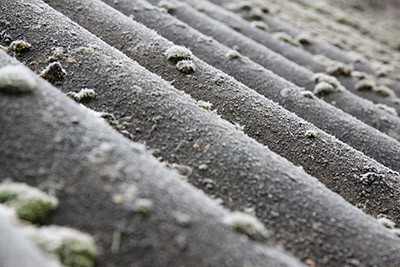 If you are a home owner and you think your roof is constructed from Asbestos Cement Sheets it is recommended that you call in a licensed asbestos company to remove and take away from site. Asbestos in any form is very dangerous to health. Inner City Environmental are an HSE licenced asbestos removal company and can provide this service to you in London and the South East. We will dispose of it to a licenced waste centre and provide you with the documentation you need to conform to the law. Please check that whoever you use is a licenced contractor with the Asbestos Removal Contractors Association. However you can carry out this work yourself but will need to seek guidance which is available from the HSE asbestos essentials website or click and download their guide to removing Asbestos Cement Sheets here. The HSE website a wealth of information about the removal and management of asbestos. If you decide to take on this work after checking you can meet the HSE criteria you will need to dispose of the asbestos. It is again recommended that you call in a company like Inner City Environmental to make sure you conform to the HSE guidelines. Waste asbestos is accepted at all Kent County Council household waste recycling centres in Kent with the exception of the Sheerness site. But no more than 5 sacks (or equivalent) per month. Wear protective gloves and a face mask and do not break or cut it when handling. The asbestos container is kept locked for health and safety reasons. Please ask a member of staff on site to unlock the container for you. They will not be able to help you lift the asbestos.